Ideologic Organ is a new sub-label of Editions Mego curated by Sunn 0)))'s Stephen O'Malley. 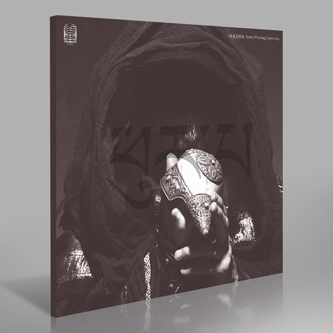 The first release is a reissue of Phurpa's 'Trowa Phurnag Ceremony', an album of traditional Tibetan Buddhist Tantric chanting by a group of Russian artists, originally released in 2008 by Sketis Music. Stephen O'Malley explains: "Russian group lead by the contemporary artist Alexei Tegin take on a trditional and ancient form of Tibetan ritual music by the name of Bon. While many aspects will be revealed to the informed listener, the group PHURPA takes the polyphonic singing style to a lower key and a slower pace. Over the course of 4 LP sides this meditative listen unveils many spectral illusions and invigorating evolutions in sonic possibilities." The ensemble use an array of traditional Tibetan instruments including telescopic dunchen horns, gyaling oboes, silnyen, bub, damaru, kanling, nga drums, and shang in accordance with the rygud-skad tradition of Tantric overtone chanting, creating mesmerising and primordial shamanic sounds authentically in keeping with ancient practice. These 2005 recordings are exquisitely cut to vinyl by Rashad Becker at Dubplates & Mastering, Berlin, May 2011, and while maybe not recommended for the casual listener, patient and isolated immersion in this record will provide an memorable experience for the deeper listening types.